To cope with the surge in passengers, China plans to build 74 new civil airports by 2020. 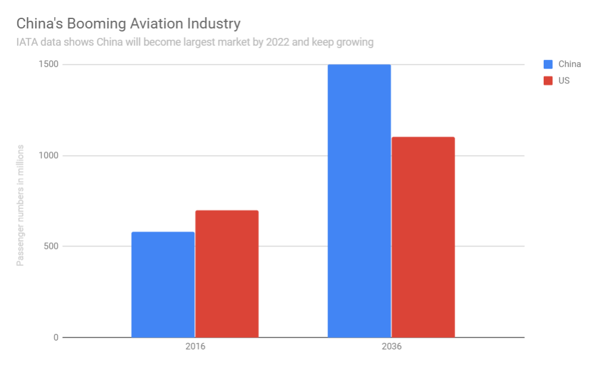 China will become the world’s largest aviation market by 2022, according to the International Air Transport Association, as an expanding middle class and government support for the sector fuel demand for flights and airport construction. The five charts below show how demand is growing. 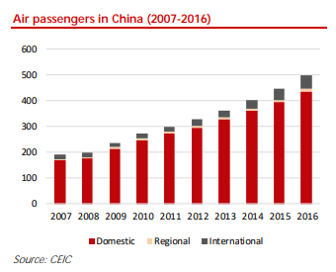 The first chart illustrates the International Air Transport Association’s prediction that China will add 921 million new passengers by 2036, taking total passengers to 1.5 billion. That compares with 1.1 billion in the US. 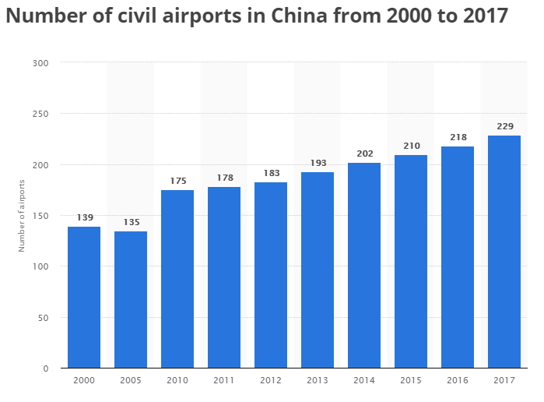 To cope with the surge in passengers, the world's second largest economy plans to build 74 new civil airports by 2020, taking the total to 260. That’s up from 175 in 2010, and amounts to more than eight new airports per year. The data on new airports was revealed in the Civil Aviation Development 13th Five-Year Plan, released by the Civil Aviation Administration of China. The development underscores how changes in the makeup of China’s population are set to ripple around the globe. The nation’s economic prosperity has resulted in income growth for much of its population, bolstering the middle class. Thirty-five percent of the population is projected to be in the upper-middle-class bracket or better by 2030, up from 10% in 2015. 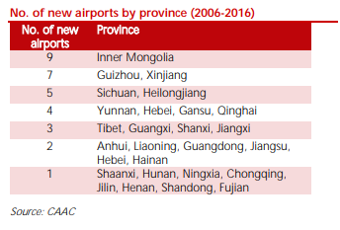 Some of the more remote regions, including Inner Mongolia, Guizhou, Xinjiang, Sichuan, and Heilongjiang, have seen five or more airports built in the last decade, according to research from DBS Group. All that means the nation’s three largest airlines: Air China, China Southern Airlines, and China Eastern Airlines are going to become even bigger international players, challenging the dominant US airlines: American, Delta and United and competing for passenger numbers. 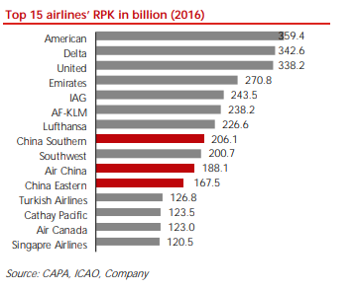 This chart shows the biggest airlines measured by revenue passenger kilometres, RPK, a measure of passenger volumes. The effects won’t just be felt in China, with increased airline competition potentially pushing down prices and passengers getting used to stopping off in Guangzhou, rather than one of the more traditional major airports for transfers.